Is it possible for nail fungus to spread through nail polish? This is a common question asked by many people. Upon discovery of nail fungus, many people mask their nails by applying regular nail polish and just hoping that the fungal infection goes away one day. This is not a good idea, as it allows the fungus to grow even bigger and may also spread to other parts of your body. Is Nail Fungus Contagious Through Nail Polish? So can nail fungus spread through nail polish? The quick answer is that it would be very rare to get a nail fungal infection by sharing nail polish, but it’s not impossible. The nail polish itself is a variety of harsh chemicals. It contains a chemical cocktail of ingredients that are toxic to organic materials. So it can be possible that the nail polish you use contains at least a few of these ingredients. Many of the chemicals feature in nail polish makes it extremely difficult for nail fungus to spread to other nails. Covering up your nail fungus with polish isn’t a good idea and we don’t necessarily recommend anyone doing it. Because polishing your nails can make the infection worse and it will be harder to cure even with the strongest fungal treatment on the market. However, nail fungus is easier to treat at its early stage, so as soon as you realize you have a fungal infection, instead of covering it up with nail polish we recommend that you get it treated as soon as possible. The answer is No! Nail polish isn’t harmful. If you like to have beautiful nails once in a while that’s perfectly fine. But, It’s not a good idea to leave nail polish continuously on it’s important to give your nails time to breathe once in awhile also. The problem with keeping your nail polish on for too long is that the pigment in the nail polish can soak into the top few layers of the nail and dry it out. When that happens we create an ideal setting for bacteria, yeast and fungus to grow and spread, which can lead to a long-term problem in the future. Even though nail polish will not spread fungal infection it can worsen the condition. The polish blocks air from getting onto the nail and underneath it. That makes it easier for water to get trapped, and fungus to spread. if you get a fungal infection, hiding the nail infection with polish will not make it go away. You still need treatment, and the problem will worsen if you don’t get it treated at its early stage. Yes, it’s highly contagious, it can be transmitted from one person to another or through various objects. If you ignore your nail infection it can spread through the body. The head, skin and fingernail are all the common areas of fungal infection. The infection can also be spread through various tool at the nail salon, so whenever you’re visiting your salon to get a pedicure or manicure, make sure to ask about sterilization. As for nail polish if you are not comfortable and to be on the safe side you can bring your own bottle. Fungal infection from nail polish should be the least of your worries because there are many ways in which you can prevent yourself from nail infection since nail fungus is contagious. 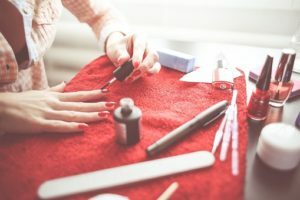 If you are ever visiting a nail salon make sure to take your own nail kit to ensure that you are not exposing your nails to any infected tools. Do not go barefoot in public places, all public places like community pool, locker rooms, showers, public toilets because they are all breeding grounds for various germs and infection. Anyone with nail fungus will do whatever it takes to make their nails look more attractive. The best way to make your nails look better with fungus is by treating them. Nail fungus needs to be treated properly before considering to just covering it up with something like a normal nail polish. its normal to want to cover up your nails or change the appearance somehow. If you do want to cover them up i recommend using a antifungal nail polish, you can check Dr.’s REMEDY Anniversary 3 Piece Boxed Set on Amazon. it’s a powerful treatment that helps to treat nail fungus while providing a beautiful cover-up solution. The polish can be worn on toenails for up to 3 weeks at a time and up to a week on fingernails. Dr.’s REMEDY Anniversary 3 Piece Boxed Set is one of the most popular antifungal nail polish on the market today. It’s also the only polish with the American podiatric association seal of approval. As you can see the formula was developed by doctors. If you catch nail fungus in early stage you can use a few coats to get the desired effects. 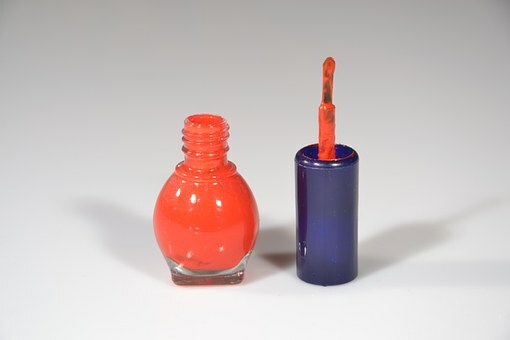 The polish is available in a variety of colors such as resilient rose, brave berry, playful pink, clarity coral and more. No one will know the difference between it and regular nail polish. How to Properly Apply Antifungal Nail Polish? Ensure that your nails are properly cleaned before applying nail polish. You can start by clipping and file your nails. This is the most basic thing you should do. With properly sanitized clippers. You can then wash and try your nails completely. Now you can apply the base coat, you can start by choosing the color you are pleased with and apply one or two coats. Let the base coat dry, it will take about an hour to dry properly. Do not apply any other antifungal polish on top of a nonmedicated base coat. Remember to let the base coat dry properly before you start to consider applying the next coat. Once the base coat is dried completely, you can now apply the antifungal top coat to your nails. You should follow each direction given in the manual or label on the bottle. But it’s important to let the top coat dry completely. You should take off the polish every seven days with a none acetone nail polish remover. wash and dry the nails completely before reapply a fresh coat. Many readers always wonder where is the best place they can purchase their antifungal nail polish. So if you are wondering as well we recommend buying your antifungal nail polish on Amazon.com. Click here to purchase Dr.’s REMEDY Anniversary 3 Piece Boxed Set on the most trusted site, Amazon.com. Is Nail Fungus Contagious Through Nail Polish? The answer is yes and no. I truly hope this guide helps you in the best way possible. Unhealthy and discoloured toenails are a big turn off. If you have nail fungus but still want your nails to be free to the public, then antifungal polish is the best option for you. Because of its powerful ingredients, it has the ability to remove the fungal infection and cover the visible signs. With the patience of using the product, the antifungal polish will cure your nail fungus when applied correctly. We do not provide medical advice so please talk to your doctor before using any new treatment on your body. Thank you.